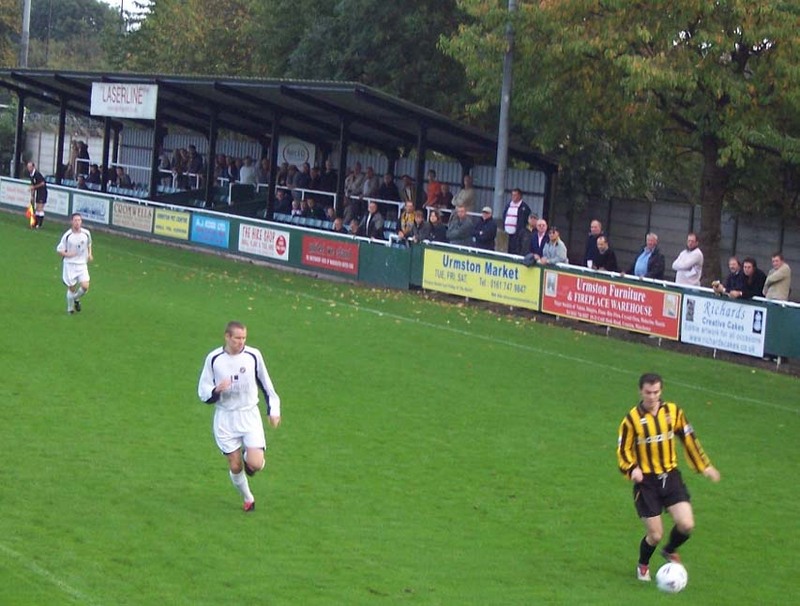 However, Harrogate Town will be a tough old obstacle, being from three divisions higher in the Conference North, and having spent their two and a half years in said division since its inception hovering around the bottom of the play-off spots. 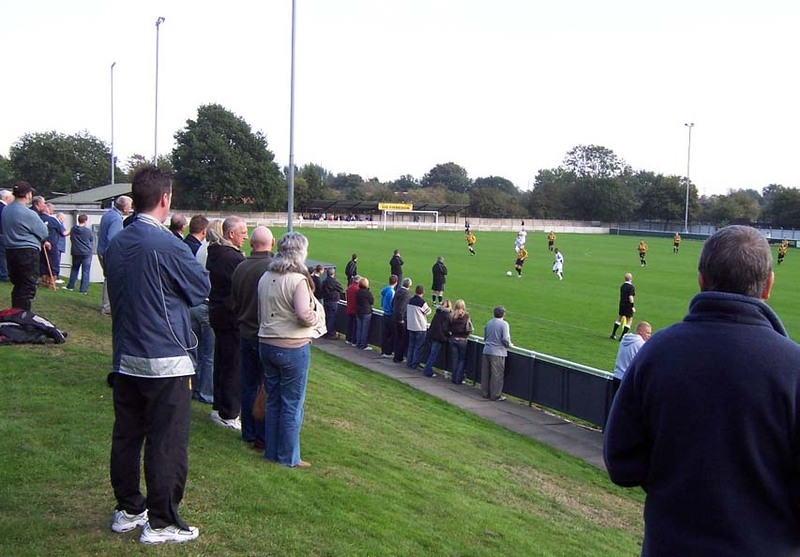 There is certainly no lack of ambition in the West Yorkshire side, particularly with former Leeds chairman Bill Fotherby now at their boardroom helm, oft suggesting how he wants to bring league football to Harrogate. He has also hardly been backwards in coming forwards in courting local residents Danny Mills and David Batty to turn out when they reach an appropriate point in their careers. That’s not to say they haven’t already got experience in their ranks, with assistant manager and sub Lee Philpott and captain Roy Hunter making over 500 league appearances between them, while Kirk Jackson and Colin Hunter might both be described as non-league journeymen. Trafford are certainly green in comparison, but while they might not be as experienced, they certainly appear more exotic, with names like Dion, Levi and Ayrton on their team sheet. They also, as a club, may not have quite as much potential as Harrogate, but that’s not to say their ambition isn’t naked. W.I.-style calendars in aid of Cancer Research will apparently be available from mid-November. Of the 284 here, Harrogate’s support make up a sizeable part, or at least they are more obvious in their waspish shirts and scarves. That said, it is a group of about eight Trafford fans gathered behind the far goal who make the initial moves with the singing, “Come on Trafford” appearing early. A popular warm-up and previous experience in North West Counties circles suggests that this might be the lot, but yet several other songs, all different, follow in quick succession. They’re certainly keen on winning the singing. Maybe it’s a cross-Pennine pride thing. After about ten Trafford tunes, three Harrogate fans, wobbling unsteadily at the top of the banking behind Trafford keeper Damien Rooney’s goal, begin a pronunciation of their side’s name that sounds not unlike a long, baritone burp funnelled through a reedless oboe. To follow, “Yorkshire, Yorkshire” appears more tried and tested material, but a round of “Neil Aspin’s barmy army” appears, at best, under-rehearsed. The first fifteen minutes of the game suggest that there has been a slight under-estimation of their opponents on the part of the Conference North side, having most of the possession thanks to the mercurial presence of Roy Hunter at the centre of midfield, but not appearing as threatening as they perhaps should. However on 17 minutes, from nothing, Hunter threads a ball to about five yards outside the corner of the box. 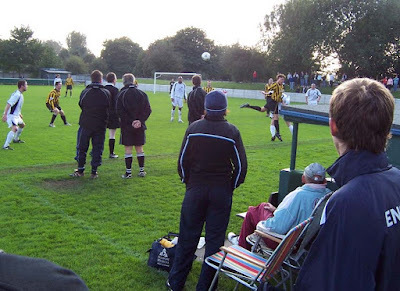 His namesake Colin runs though and sweeps his right foot like one of Windy Miller’s creaky vanes over the ball to counter its high bounce, catching it sweetly so that it sails slowly before dropping just beneath the bar [see picture below] into the far corner. Sweet. Trafford don’t give up and its bitty stuff for the next twenty minutes, before Harrogate step up through the gears again. Rooney has to make a save from a header down by his right hand post, while a cheeky cross-come-lob-come-shot from Chris Bettney drops with a heavy sigh a foot beyond the far post. With two minutes of the half to go, Colin Hunter breaks down the left and rifles a shot across Rooney who again show his process down by the heels. 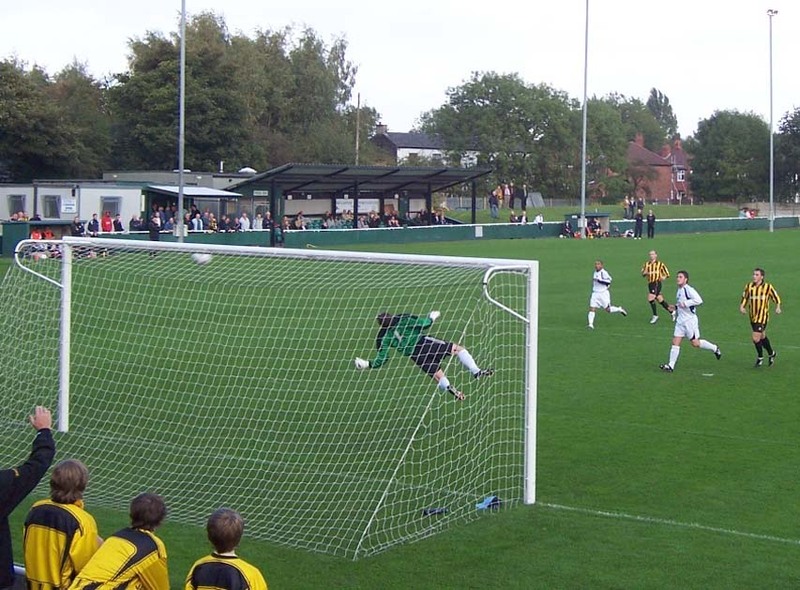 From the corner Roy Hunter’s loopy header from the edge of the area drops just over the top. Then Trafford somehow manage to force a corner, but the ball is easily cleared and dropped again between the apparently brick-booted Trafford defenders, but Danny Holland’s lob is just a bit too roller-coaster steep. Harrogate are certainly not afraid to have a crack. A minute into injury time, Colin Hunter, this time under pressure, fires a fierce shot to once again bring the best from the now continually diving Trafford keeper. He also has the first chance of the second half, snapping a shot through bodies into Rooney’s chest, the keeper reacting as though having just pulled back the loose lid of a suspiciously plainly-labelled tin of peanuts. On 67 minutes, a Trafford free-kick is drilled in from the right and defender Chris Ellerker’s back-flick is almost disastrous, but for the timely intervention of Leigh Wood. The second half though is largely untroubling for the scorers, although Ellerker makes another almost vital contribution, this time at the right end as he heads a corner over from eight yards. 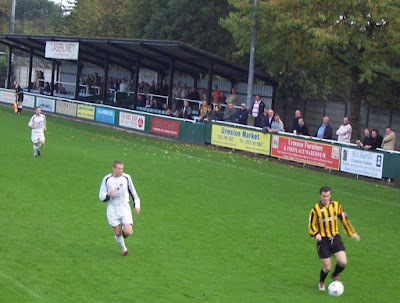 Mind you, while Harrogate may have expected more of themselves against opposition such as Trafford, the lower-ranked side could not come close to breaking down the door for all the admirable efforts. The Harrogate fans might have wanted more to cheer or, at least, to bellow at like a drunken Lord, but when a clean sheet appears largely guaranteed, why waste the goals? “In the next round I would like the lowest ranked team left in the competition at home,” said Harrogate manager Neil Aspin after the game, with all the confidence of Scooby Doo preparing for a job interview at a funeral directors, but it will be Conference side Tamworth waiting to host them. They may indeed need a few of them goals in reserve.